You must sign into your myHangout account in order to contact Norm2704. First of all, Rob Bourassa, with all is video lessons, got me situated and started, I thank you sir! John Boulding, another incredible teacher. Not sure if anybody else here at the Hangout has given so much for free, to help me/us along this road. Thank you! Eric Schlange, for creating this place, and for free... Just wow! Thank you..
Geoff Hohwald, his lessons have been are still of great help.. Thank you! Jack Baker, The tabs you had available, were/are incredibly helpful. Thank you! I will add more as I remember them.. LOL.. I still have a long way to go, and may never reach the state as a banjo player as the incredible people I mentioned above, And you may never even read this, but, THANK YOU SO MUCH FOR YOUR HELP and guidance! !, (I know people here may not say it enough). I hope that somehow, sometime I can return the effort of even pay some of it forward like you have..
First Banjo Blog - And Banjo updates..
2004 Fender American Jazz Deluxe Bass Guitar, 1985 Yamha Eterna Acoustic Guitar, Epiphone Les Paul Electric Guitar, and now a 2010? 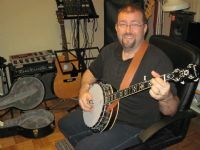 Epiphone MB-250 Banjo!! !